The program begins with some time for silence to rest the mind and practice meditation. We continue with meditation with the chanting of Moksha Mantras, or Mantras for Liberation that heal the body, mind, and spirit on all levels. Shri Yogi Hari then encourages questions from attendees to prompt a topic for the evening lecture. 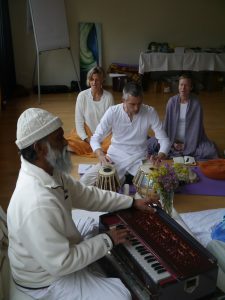 Lectures are informed by knowledge from the Vedas, or ancient scriptures, as well as from Shri Yogi Hari’s life experiences of over 50 years of practicing and teaching Yoga. If you are looking for a way to promote inner peace, good health, and happiness, look no further. Come out to Yogi Hari’s Ashram to experience Satsang with a genuine Yoga Master.